I have been battling acne for as long as I remember. I was excited to get the chance to use this system. I have been using this system for about 2 months and a half and I am loving the results I have gotten. My cheeks are not as red as they were when I started using this and my break outs have greatly diminished. Anti-Aging ingredients directly target the primary symptoms of acne: Micro-emulsified moisturizers dissolve impacted oils that clog pores and cause breakouts while natural fruit acid complexes exfoliate excess skin, preventing this tissue from creasing pre-emergent facial fissures into visible wrinkles. Micro-emulsified golden jojoba penetrates and reduces sub-visible skin fissures and visible wrinkled tissues. Vitamin C Esters stimulate collagen firming skin. Alpha Lipoic Acid protects against environmental stresses and free radicals. 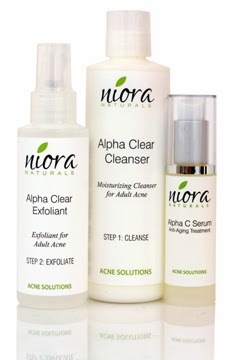 Alpha Hydroxy Fruit Acid Complexes exfoliate, tone, fade age spots and wrinkles stimulating fresh new, healthier skin. When I was a teen I went to a dermitologist and they told me it was my age that made me break out. I was also told when I reached 25 that it would clear up. Now I have reached 25 and I still had acne just as bad as when I was a teen sometimes worse and it had shown no signs of going away. Instead of treating my acne like they could have they let it run wild which left me with lots of scarring on my cheeks. It got to the point I didn't want to look into a mirror because of what I saw each time I looked at myself. I still get breakouts at 34...ill have to check this product out! Im gonna have to look into this! I never had acne problems until I got pregnant and now I get breakouts off an on all the time.